Brian Tracey on bongos playing with Jameson's Revenge. On Sunday night, a throng of people from far and wide packed Connolly’s Klub 45 room in Times Square to give a proper Irish wake to the great Mickey Finns lead singer Ray Kelly, including another Ray Kelly! The New York City police commissioner posed for pictures and offered a heartfelt gesture of condolences to the Kelly family members who were in attendance. That was one of the many delights in an evening that featured the kind of lineup that a festival organizer would give his eye teeth to get. Jameson’s Revenge set the bar high with a spirited set of traditional ditties played with their classic outer borough attitude. They leaned into their instruments and played hard, weaving intricate melodies effortlessly. Cathie Ryan offered a thoughtful set of well played traditional instrumentals along with songs from her fifth CD, Through Wind and Rain. It’s no wonder our sister publication Irish America magazine twice named her one of the Top 100 Irish Americans, and Chicago’s Irish American News has twice honored her as Irish Female Vocalist of the Decade. I chatted with Larry Kirwan backstage, who always has a million irons in the fire. Of course, Memorial Day wouldn’t be right without the boys in the band leading off the festivities at the East Durham Irish Festival, and Kirwan is looking forward to the gigs. He is celebrating eight years at the helm of Celtic Crush, the wildly popular weekly radio show on Sirius, and he hopes to have his musical Hard Times staged in Manhattan in the first part of next year. Black 47 took the stage for a short yet hard-hitting set. They dedicated “James Connolly” to Kelly because, according to Kirwan, it was his favorite song. 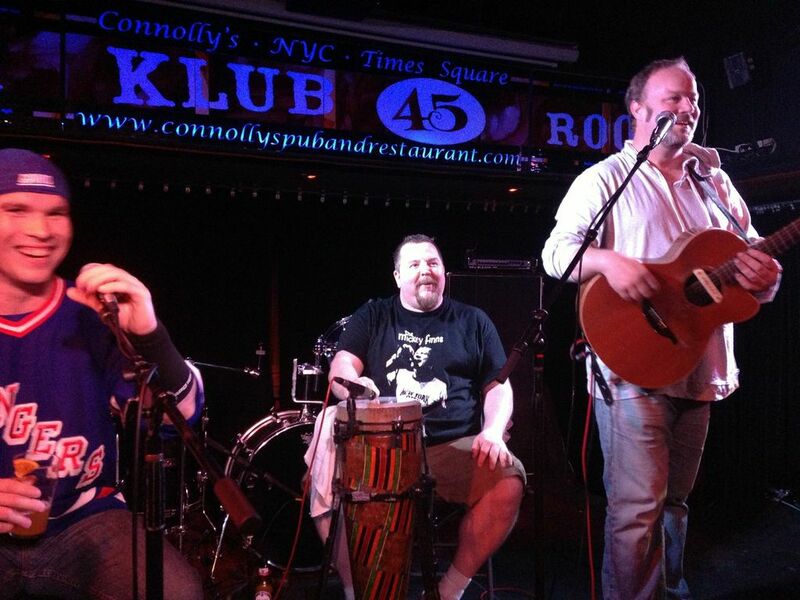 “Funky Ceili,” “Rockin’ the Bronx,” and “Big Fellah” were greeted by the adoring crowd like the old friends they are! “Following Black 47 -- not too tall an order,” joked a somewhat sheepish Colm O’Brien. He needn’t have worried. Armed with nothing more than an acoustic guitar and that delicious, raspy voice, the former Prodigals co-frontman provided as much firepower as a whole band. He wove funny stories in between old warhorses from Luke Kelly and tracks from his own two solo albums. Since moving to Boston with his family, sightings of O’Brien on a Manhattan stage are few and far between. It was a rare treat to see him again, and he packed in as many appearances as he could during this weekend. He sat in with his old buddies in the Prodigals the night before. Mickey Finns founder and drummer Brian Tracey has taken Ray’s death particularly hard; he confesses that it was hard to think about music in the weeks following his sudden passing. As everyone shook off the shock, the Mickey Finns were encouraging their leader to get back onstage. Tracey has been quietly gigging throughout Manhattan over the last few weeks, and it was a pleasure seeing him play with the likes of Jameson’s Revenge. His face lit up as he played the bongos. He would join his bandmates later that night with Padraig Allen (from McLean Avenue Band) in the lead singer’s slot. Though he isn’t ready to announce anything yet, Tracey is close to identifying a new lead singer to fill Kelly’s big shoes. “I know he would have wanted it and I am finally in the head space to put the pieces back together again,” he says. That’s music to this fan’s ears! I wasn’t the only Mickey Finns fan in the building. Folks came from as far away as Cleveland to Binghamton for this event, and Tracey was peppered with their well-wishes all night. The night became a bit blurry after that, The Prodigals played and were briefly joined by O’Brien. Padraig Allen took the stage with the Mickey Finns and fit right in with their southern fried Celtic rock. Many pints were raised to the heavens as we toasted the great Ray Kelly all night. It was a perfect Irish wake for a truly amazing character!